Central serous retinopathy is the elevation of macula (central part of the retina) due to leakage of fluid from the choroidal circulation. In normal conditions fluid leakage into the retina from the choroid circulation is prevented by retinal pigment epithelium. In CSR fluid equilibrium is disturbed leading to leakage beneath the neurosensory retina resulting in retinal detachment (macular detachment as CSR commonly involves macula). The disease is more commonly associated with severe stress or steroid intake more common in men of the age group 25-45. Disturbance in central vision either loss of central vision or waviness. If CSR does not involve macula the person can be asymptomatic. 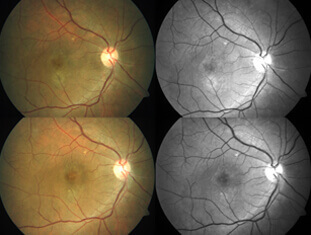 Fundus fluorescein angiography (FFA): The test reveals a focal spot of leakage and dye accumulation in the sub retinal space. The ophthalmologist is able to identify the area of detachment and the exact site of leakage from this test which guides him in treatment. Optical coherence tomography (OCT): Test shows the section of the retina which shows the extent and the height of detachment. It also shows the secondary changes of retinal pigment epithelium that include RPE alterations, hypertrophy and serous pigment epithelial detachment. Laser treatment: Leak is identified and the laser is applied to the leak. Each case must be approached individually depending on the location of the leak and the recurrences. For example, if the leak is identified in the centre of the fovea treatment should be more conservative as the laser therapy may cause inadvertent damage to the fovea or haemorrhage. 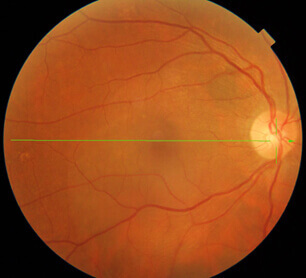 In a patient who had a previous detachment which resulted in atrophy or scarring of the macula earlier treatment of a leak in a subsequent detachment should be considered as longer the detachment greater the risk of permanent damage to the macula. Sub-threshold micro pulse yellow laser is ideally suited for the management of such cases.